With apologies to my dairy free friends who also keep kosher or halal, I have to tell you that these cookies were so delicious, so sublime, that they might have replaced traditional butter-based Scottish shortbread for my favorites of this type of cookie (I will continue to make both though, because Scottish shortbread is fabulous in its own right). I made them out of desperation, but they will surely be made again and again out of desire. Yes these are made with lard. I have said it before, but in case you missed the lecture, lard is healthier than butter (less saturated fat), it makes good use of that pork tenderloin you ate for dinner (i.e., it is not wasteful of the other pig parts), and it is natural, unlike, say, shortening. If you use a good, freshly rendered and roasty-tasting lard, it makes the best pie crust you have ever tasted in your life. When my pie-making mom switched to it I became a crust eater, after having avoided the bland crust my entire life. It is tender and flakey and absolutely delicious. 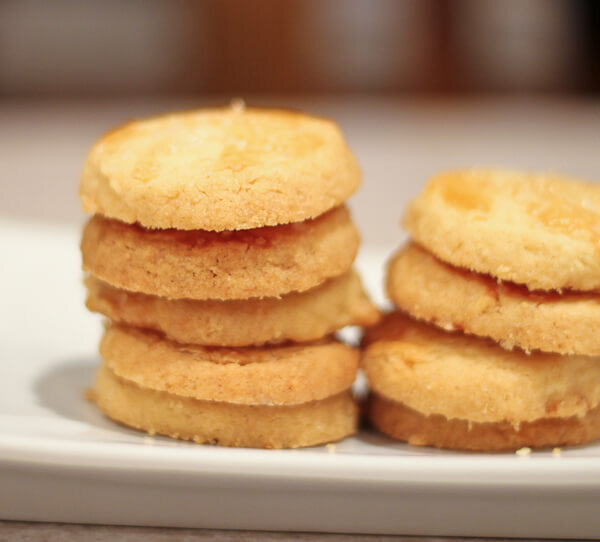 Not coincidentally, these cookies taste like a cross between shortbread and pie crust. 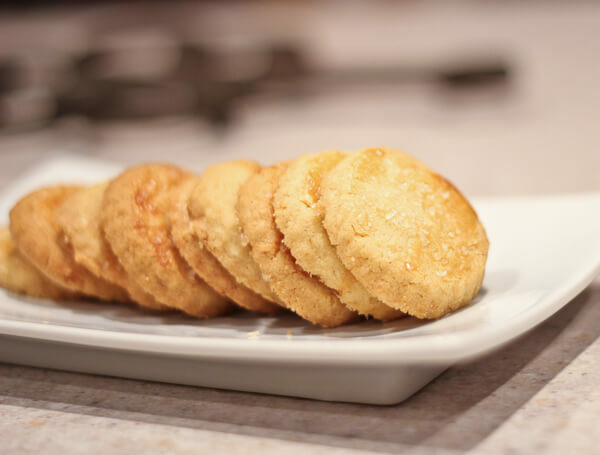 I literally whooped and hollered when I made them, because I had been terrified that having gone dairy free I would never again experience that tender, crumbly, flaky, melting sensation of shortbread in my mouth. One quick note about the recipe title: I could not taste the lemon or cinnamon, I think they just contributed to overall flavor. I left Casas’ title intact below, but did not use it in my post title because I personally find it a little misleading (but you won’t mind having been misled!). Using an electric mixer, beat the lard and sugar until light and fluffy. Stir in the cinnamon, lemon zest, egg yolk. Stir in the flour. Do not overmix at this point. You may notice a faintly roasty-pork scent--do not let it make you nervous, when the cookies are baked they will be delicious and distinctly a dessert cookie. Shape the dough into a disc and wrap in plastic wrap. Chill for 30 minutes. Preheat the oven to 425 F. Roll the dough on a floured surface out to ⅜ - ½ inch thickness (yes these cookies are thick). 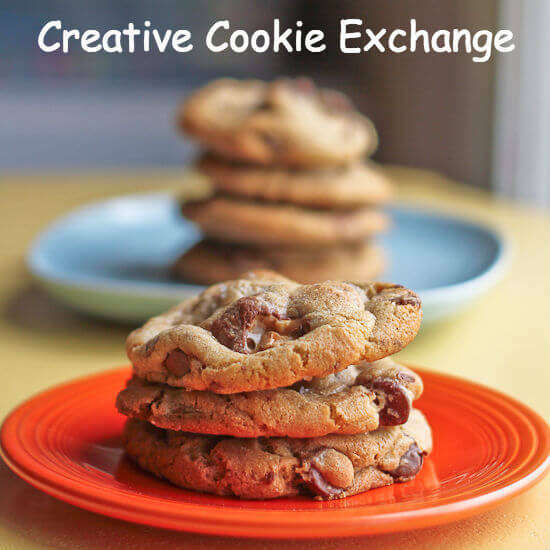 Cut them with a 1¾-inch diameter round cookie cutter. I used one with a scalloped edge on Casas' recommendation. Gather the scraps, re-chill if necessary, and re-roll and cut out cookies until the dough is gone. Work the dough as little as possible. 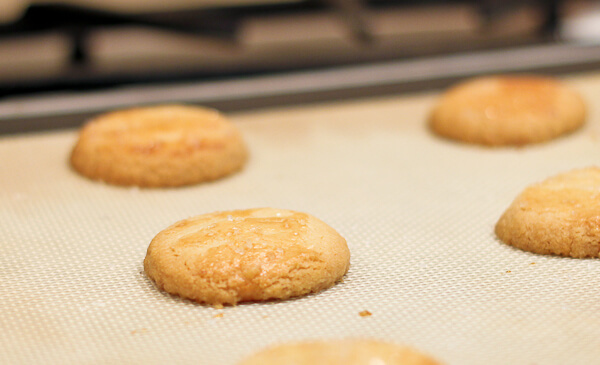 Place the cookies on a cookie sheet lined with silicone or parchment. Brush the tops of the cookies with whisked egg white and then sprinkle the coarse sugar on top of them. Bake for 13-15 minutes, until the cookies are golden brown. Transfer to a cooling rack after 3-5 minutes. Let cool completely. Amazon affiliate links were used in this post, but only to link to items I would be discussing and linking to in any case. Thanks, Laura! These look wonderful, and the book….rustic Spanish food? Come on! I appreciate the lead. I give the lard lecture myself, but have not made too many converts. you sound as if i was not using lard before i switched to the savory lard. i always used lard, and i will have you know that many people loved my pie crust prior to your conversion! Yes it is true, my mom’s pies are universally adored. However *I* never cared for the crust much until she started using the real deal unprocessed lard. 🙂 Love you, Mom. Laura, this are absolutely awesome! Must bake these. I love shortbread cookies. But I love the healthy approach to this one even better. Thanks for sharing! I can only imagine the flavor. The texture looks perfect. Oh they look amazing!! Lemon, cinnamon, mmmm! What gorgeous looking cookies. They are just perfect (photos, too). Lemon/cinnamon are just so good together. Hard to believe they’re dairy-free! What pretty cookies. The lard would give them a really interesting flavor. I’m planning to try this recipe today. I’m making them for a friend with a lemon allergy. Would you suggest subbing lime or orange? Or should I just omit and not replace? Thanks! A little lime and orange mixed would be nice–but ultimately either alone could be used as well. Orange peel can be quite strong so I would use a little less of it. Let me know how they turn out! Yay! Glad to hear they turned out well and glad the sub worked! I had a hard time with these cookies. I followed directions and chilled them an extra 30min on top of the recommended 30. 10 minutes into their time in the oven I started smelling something burnt, I pulled it out to find a mess of melted cookie dough smoking at the edges and bubbling in the middle. Where did I go wrong? Wow. That would be upsetting–so sorry that happened! How did you measure the flour? Mis-measured flour and an oven that is not registering correctly for temperature are the only 2 things that are occurring to me if you followed all the directions exactly. The Oven thing is very possible- Its an extremely small oven, and I have had problems with inaccuracy before. I’ll try the same recipe at my best friends place and hopefully things will come together better. Thanks for getting back to me! Let me know how it goes–if you still have problems we can trouble shoot more. It is such a fantastic recipe, I hate that it is not working for you. I am new to lard but am considering substituting partially for butter i.e. 1/2 cup lard, 1 cup of butter (the recipe calls for 3/4 pound of butter. My concern with using 100% lard is they will turn out more like crust than a cookie. The photo of your cookies look more like a crust than a cookie. What do you think? Hi Dee: Subbing butter for lard is NOT a 1:1 substitution. Butter has water content whereas oil, lard and shortening do not (and further complicating matters is that American and European butters have different water percentages). So if you sub 1:1 with butter, the cookies will have less fat. Honestly I am not sure how to address your concern since I definitely thought they were delicious cookies. Would you have had the same concern if you were using shortening? I suspect you are overthinking the lard part. 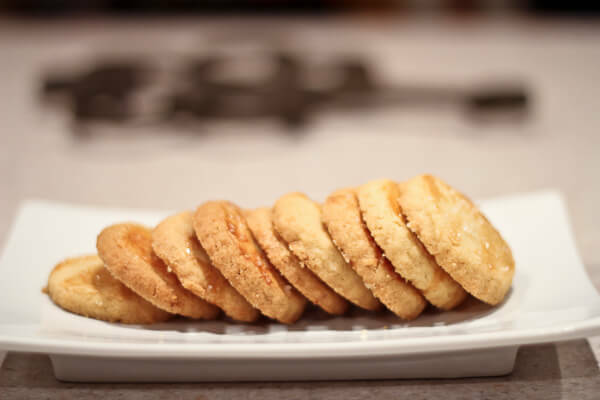 The cookies are similar in texture to shortbread. I say have some faith and give them a chance!